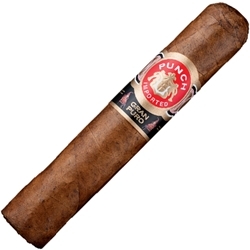 Punch Gran Puro Santa Rita, is a medium to full bodied strength premium cigar hand rolled in the Robusto size, produced with a rich flavored Honduran tobacco leaf wrapped around a unique blend of fillers and binders from the regions of Honduras. Punch Gran Puro Santa Rita cigars are produced in Honduras from Cuban-seed tobaccos grown in Honduras, Nicaragua, and the Dominican Republic. Each of these Punch cigars are hand rolled and bursting with a bold, full-flavored taste. A definite go-to brand among cigar enthusiasts! Try them here at Smokers Discounts!